Unsure about enjoying a Japanese kaiseki meal the correct way? Fret not—here’s how. 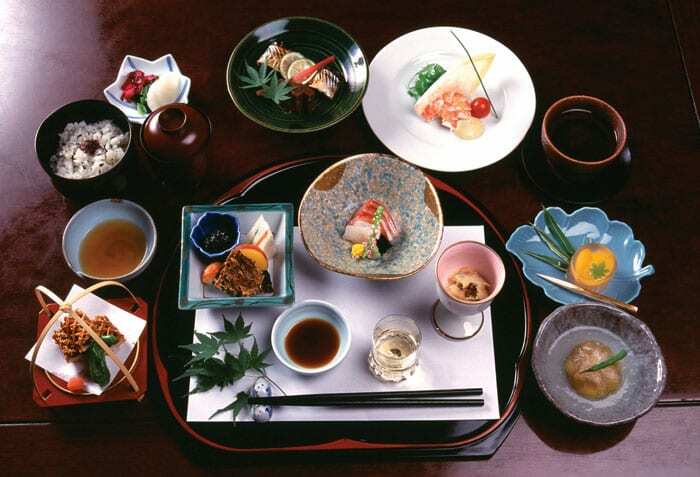 If you’ve tried haute-cuisine kaiseki ryori while on holiday in Japan, lucky you! But like many sampling kaiseki for the first time, you may have also felt unsure about how to approach this elegant and seasonal multi-course meal. It might help to learn that despite its sumptuous spread, kaiseki has humble roots. Once a modest meal served before a tea ceremony (cha-kaiseki), kaiseki became influenced by imperial court and samurai family cuisines. It is this formal-occasion style—seasonal ingredients, meticulous preparation and multiple courses—that is found in most kaiseki restaurants today. Kaiseki chefs have their own styles, and you can find many variations at ryotei (elegant traditional Japanese restaurants) and ryokan (traditional Japanese inns). It is expected that chefs improvise with their menus, and that many different dishes are added or removed depending on the season and place. Only seasonal ingredients are used for much of the menu as it is essential to bring out these natural flavours at their peak, such as takenoko (bamboo shoots) in springtime or matsutake mushrooms in autumn. Sometimes, the starters are transformed or even left out. The soup (suimono) and rice (shokuji) courses usually remain. A kaiseki spread is made up of several courses in small individual portions that are beautifully plated, with each plate or bowl carefully chosen to complement the food and season. All kaiseki meals share a sense of omotenashi (wholehearted hospitality), respect and anticipation. You can see this in the careful attention that is paid to the customer and to every detail of the meal. With kaiseki as the pinnacle of Japanese cuisine, it is no wonder that following the correct etiquette is just as important to fully appreciate such an exquisite meal. • Sakizuke: This first appetiser may come in different variations. But in general, do not lift the sakizuke tray. Raise the bowl to your lips. If the dish has skewered food, do not bite into it. Instead, use your chopsticks to remove the food from the stick and place it onto a plate. • Suimono: The soupy dish, usually cooked with seafood and vegetables, is served in a covered bowl. After opening the lid, enjoy the fragrance of the soup. Carry the bowl as you sip the soup and place the lid back on the bowl after you’ve finished. • Mukozuke: This sashimi dish usually includes white fish in front, shellfish in the middle and red, fatty fish at the back. Eat the more delicate white fish first, then the shellfish and then the fatty fish. • Yakimono: This flame-grilled course usually comprises seafood like fish or scallops, and meat like beef. When eating seafood, you may touch the shells and bones with your fingers. If a meat item cannot be eaten in a single bite, try to finish it in two or three mouthfuls while holding it with your chopsticks. • Nimono: This simmered dish is served in a bowl with a lid. If the bowl is small, hold it in one hand. If it’s big, you can leave it on the table and eat from it. • Agemono: This deep-fried dish is usually made up of tempura, with lightly battered seafood and vegetables. Eat the items from front to back, dipping them a little in the provided sauce or salt seasoning. Don’t leave them half-eaten on the plate—a big no-no! • Mushimono: Often an egg custard (chawanmushi) made with steamed food. Carefully open the lid to let the steam escape and dig in gently. • Sunomono: This vinegary food is quite juicy—eat it while holding the bowl to avoid any spillage. • Gohan, tomewan and konomono: Served at the end of the meal. Eat the rice (gohan) and miso-based soup (tomewan) while they are warm, together with pickled vegetables (konomono). • Mizumono: Dessert ends the meal on a sweet note, either in the form of fruit, ice cream or confectionery. If the meal includes matcha (green tea), finish the confectionery first before drinking the matcha. The next time you’re at a kaiseki restaurant, try following these tips on table manners to fully enjoy this most refined of Japanese dining experiences!